Contests, surveys and TV shows that try to answer the question of who best symbolizes Russia are extraordinarily popular. The results are sometimes very unpredictable. In the end, though, the title of Russia’s favorite author would probably go to the poet, singer and actor Vladimir Vysotsky—and by a very wide margin. On the evening of July 25, 1980, I was returning to Moscow from Odessa. Walking through the train station to the train, I sensed that something very bad had happened. People were whispering furtively. The atmosphere was nasty and oppressive. Were we at war? I approached a group of men who were talking intensely but quietly. Everyone loved Vysotsky, and everyone still does. We have great poets, singers and composers, but Vysotsky was one-of-a-kind: a folk poet with a guitar. People think of him as a friend, a brother, a father. His songs are about everything and for everyone—war, sports, medicine, geopolitics, science fiction, alcoholism, history, travel, aviation, religion and much, much more. And his songs are always from the heart. To many in those days, it was like Vysotsky was with them—in the foxhole, on the reconnaissance mission, in the fighter jet, in the mine, in the hospital, in prison. He was the Russian archetype, embodying the Russian mentality and the Russian character, a man who knew no boundaries and was willing to follow through to the end. If he was in love, then it was ‘til-death-do-us-part. In war, he was in it to win. If he was drinking, it was until delirium tremens. Vysotsky's style was rooted in traditional Russian ballads, gipsy and blatnoy (criminals') songs In some places, he was like a chansonnier, like Georges Brassens. He combined text with exuberant energy and a unique, low, husky timbre. He began writing his first songs dominated by the blatnoy theme in the early 1960s. Around that time, reel-to-reel recorders began to appear in the Soviet Union. 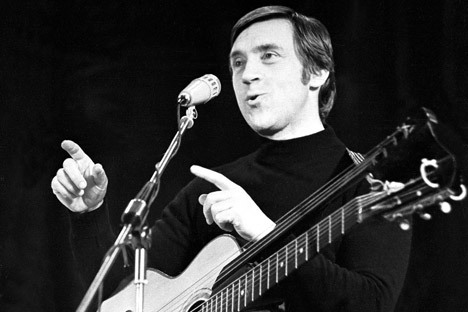 Vysotsky's songs from residential and underground concerts were copied and passed around. After a few years, he became known throughout the country and without ever being heard on the radio. The quality was terrible, as each successive copy added noise and distortion. But Vysotsky’s hoarse voice and often frustrated guitar reached the listener. It was, for many, like a breath of fresh air. In 1979, as a student at Bauman Moscow State Technical University, I was able to attend one of his concerts. There was a rumor going around in the department that Vysotsky was giving a concert there. I hadn’t seen any posters about it, and no one said anything about tickets. Everyone knew that the concert would be unofficial. All the seats were occupied. Students and staff were trying to squeeze into one seat together. People were standing in the aisles and along the walls. On the empty stage were two microphones: for vocals and for guitar. When he emerged from behind the scenes, the audience burst into applause. Vysotsky, dressed in a beige turtleneck and brown pants, walked over to the microphone and began with “Fires,” which, at that time, was little-known. Then he greeted the audience and asked someone to turn on the lights so that he could see the faces of the audience. The invisible wall between the stage and the audience vanished. He sang “Dear Broadcast” and “Comrade Scientists.” We wouldn’t let him leave. We kept asking for encores. As happens with stars, there were a lot of rumors about Vysotsky. He has always had enemies, and many people envied him. They said it was no accident that Vysotsky had enormous privileges in the Soviet Union, and he got away with a lot. A few days ago, news broke that Vysotsky’s son Nikita won his lawsuit against the publishers of a book in which Vysotsky is portrayed as a KGB agent, drug dealer and terrorist. Passions flare around Vysotsky to this day. He died more than 30 years ago, but he is not forgotten. Unreleased recordings crop up on a regular basis. Friends and contemporaries write reflections on his life. There was even a series of albums called “Vysotsky: The New Sound,” in which, with the help of the latest technologies, Vysotsky's voice is mixed with modern rhythms. Every year on his birthday, Jan. 25, Russian TV channels broadcast his movies and programs devoted to him. For those who would like to draw parallels between Vysotsky and performers from other countries—for example, Bob Dylan and Charles Aznavour—I would note that Vysotsky was a purely Russian phenomenon. You will not find a Japanese or American Vysotsky, although he has many imitators and admirers in the most unexpected parts of the world.